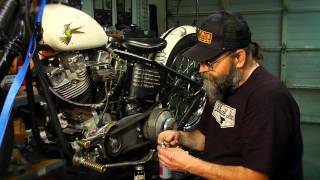 In this instructional videos for garage builders brought to you by Lowbrow Customs, chopper guru Frank Kaisler takes you through the care and service of Harley-Davidson's venerable Shovelhead engine. Knocked it out of the park with this one! OK, of course, it's not perfect but, it's the best that I've ever seen. I have watched it over and over again. Would love to see a step by step video by Frank Kaisler on re-jetting and tune-up for S&S super E carburetors. It doesn't matter how much you know if you can learn just one more thing from one of these DVD's. Very good. I had the Ironhead dvd also. Been a fan of Frank since Hot Rod Bikes magazine. I just wish the clutch cable adjustment would have been included. lots of info that helps a lot on the dvd . Run into problems taking bike apart just watched and gives me step by step! There will not be any head removal it is tune and service I would assume pushrod adjustment would be covered .